Coming into this NFL regular season, the Philadelphia Eagles are the talk of the league as no team has made more moves to improve their team than Andy Reid and company in Philly. The Eagles are always a competitive football team every single season under head coach Andy Reid, but they might be the best all-around team in the league this time around with a potent offense led by superstar quarterback Michael Vick and a lockdown defense led by perennial Pro Bowl corner Nnamdi Asomugha. The one move that the Philadelphia Eagles were going to make once the NFL lockout was over and done with was trading backup quarterback Kevin Kolb. This was considered to be a sure thing and move that the Eagles would definitely make and they did just that, but they didn’t stop there as Philly was looking to surround Michael Vick with as much talent as possible on both sides of the football. 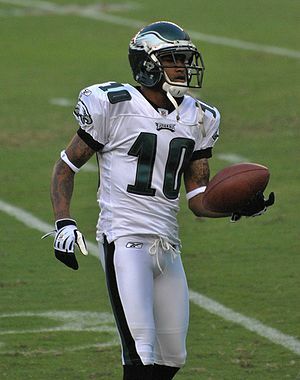 As if the trade to acquire star corner Dominique Rodgers-Cromartie in exchange for Kevin Kolb was enough of a boost to the defense, the Philadelphia Eagles went on and signed the most sought after free agent available in perennial Pro Bowler Nnamdi Asomugha. Not only is Asomugha considered to be one of the best players at his position in the NFL, but the free agent signing may have bumped the Eagles up to arguably one of the best defenses in the league heading into the upcoming regular season. Along with signing Nnamdi Asomugha, the Philadelphia Eagles also locked up backup quarterback Vince Young and running back Ronnie Brown. All these moves have turned the Philadelphia Eagles into a legitimate Super Bowl title contender, but one move that team need to make before next season was getting star wide receiver DeSean Jackson back on the field. Once the NFL lockout ended the DeSean Jackson camp holdout began. Heading into this upcoming season, DeSean Jackson was coming into the fourth and final year of his rookie contract and was set to make $565,000. Obviously, this is a steal for the Philadelphia Eagles as they get a two-time Pro Bowl wideout with punt return ability for about half a million dollars. Usually, when a player in the NFL holds out during training camp that player can get a bad rap and be labeled selfish. With Jackson’s personality, the first thing everyone thought was that he was a typical selfish diva wide receiver, but that isn’t the case as this rising star is definitely worth much more than what he is set to be paid. Now the Philadelphia Eagles and DeSean Jackson have agreed to start talking about a contract extension that will almost certainly make the two-time Pro Bowler a very rich man in the years to come. It is uncertain how much Jackson is set to make, but I would expect it to be a lucrative multi-year deal that keeps him rich and in Philly for a long time. Could Plaxico Burress turn into the favorite target for Mark Sanchez?